Palestinian photographer, Mustafa Kharouf, a resident of East Jerusalem, was arrested by Israeli police on January 22, 2019, and has been detained in Israel’s Givon Prison, and is facing expulsion to Jordan, for what Israel claims are “security concerns”, reported Anadolu. The Palestinian Journalists Syndicate (PJS), in a statement on Wednesday, called the continued imprisonment of the Anadolu Agency photographer, a “blatant assault on his right to live and work in the city of Jerusalem, where he has been living and working for 20 years”. The PJS appealed to the International Federation of Journalists (IFJ) and human rights groups to strive to apply “serious pressure on the occupying state [Israel] to prevent the implementation of this crime [deportation], which violates international laws and covenants”. The arrest and detention of the photographer, is characterized by the PJS as “an attack on freedom of the press and freedom of movement”. 32 year old Kharouf was born in Algeria, to an Algerian mother, and a Palestinian father, moving to occupied East Jerusalem when he was 12. Israeli authorities have long denied Kharouf a long term residency permit, however, Kharouf’s lawyer, Adi Lustigman, Kharouf is not a “citizen of any other country”, and “has no other place where he can legally be”. Lustigman told Anadolu, “this is unacceptable anywhere in the world, but unfortunately, many Palestinian families in East Jerusalem face similar problems”. According to +972 Magazine, Khafour is married to a Jerusalemite, together they have a small child, living in East Jerusalem. In 2016, Kharouf “reached an agreement with the Interior Ministry to undergo a process of family unification”, which his criminal and security record was inspected. 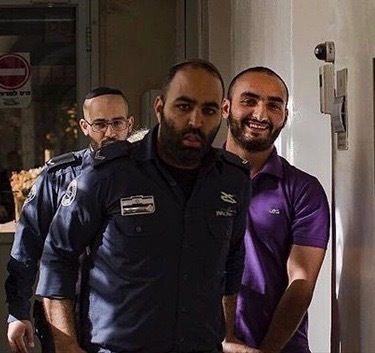 On January 21, 2019, Kharouf’s lawyer was informed that the unification request was denied, an attempt to appeal was made, however, early the next morning Israeli police and Immigration inspectors raided Kharouf’s family home, and arrested Kharouf. The Interior Ministry “claimed it received recent ‘classified material’ from Shin Bet”, Israel’s Security Agency. Kharouf’s superior, Turgut Alp Boyraz, at the Turkish news agency Anadolu stated at the tribunal on Feb. 19, 2019, called the allegations “baseless”.